“Celebration” and “The Room” by Harold Pinter. Directed by Neil Pepe. Produced by Atlantic Theater Company. Let the following remarks serve as an homage to Harold Pinter who has recently passed on. Winner of the highest awards given to dramatists including the Nobel Prize for Literature, Pinter was prolific, by common consent a sign of genius. Not including television and film scripts and collaborations, he wrote thirty-two theater pieces, the first of which, “The Room” was produced last year by The Atlantic Theater Company in New York on a double bill with his latest work, “Celebration.” Together they offered a graceful program and a token honor to the playwright’s accomplishment. Remarks on the plays are repeated here as a substitute for an obituary that might feel gratuitous about an artist who plainly will live on. “The Room” is a short play dense with elements Pinter would develop significantly in many later works, in particular “The Caretaker.” A domestic space suggesting the security of home and hearth belongs to a working class man and wife, Bert and Rose Hudd, seen from the “outside.” In seemingly random succession, several persons arrive and chat familiarly about the weather, the house, and the like; then a climactic and terrifying explosion of gratuitous violence occurs. This summarizes the action. Applying Pinter’s own generalization that the meaning of his plays lies in their titles, “The Room” pivots on a horrific contrast between appearance and an unexpected reality, that old chestnut, between ordinary domestic place and extraordinary occurrence. Rose Hudd (Mary Beth Peil), a homely, middle aged woman in a worn cardigan, feels satisfied and grateful for her unpretentious little room. It is knowable–“you know where you are here” she says several times, talking to herself, remarking on the cosiness of her place against the “murderous” cold just outside her kitchen window. Her husband (Thomas Jay Ryan) reads his newspaper in unbroken silence and soon goes off. “No one bothers you here” Rose tells herself. That’s the ironic tag line before a series of visitors invade Rose’s space so that its stability turns out be illusory. A man appears whom Rose addresses as the landlord, Mr. Kidd, but who reports on a couple looking for the landlord in the basement. It is the first of several disjunct remarks that quickly destabilize identity: Kidd may or may not be the landlord. The couple, perhaps the one referred to earlier, arrive at Rose’s door and chat with her about ‘whose who’ and ‘what for,’ immediately creating another kind of estrangement in the familiar. Rose begins to protest these incursions on her privacy. They add up to a feeling of menace when blind Riley, a black man, (Earl Hyman) comes with a mysterious message saying Rose is to come home to her father. Or perhaps Riley is her father? The disturbing idea is left hanging. Very few words are spoken; Rose screams in confusion bordering on terror when her husband returns, again in silence, to beat and kick Riley to insensibility. He is left, perhaps for dead, in a heap on the floor. Rose screams “I can’t see, I can’t see” and the curtain falls. Has Riley’s blindness transferred to Rose? Why? The supposedly secure room with its warm fire is invaded by danger and the irrational. People appear at random and fail to recognize each other. Rose tries to accept Riley, timidly caressing his head as he sits at her table, until the husband enters. Then suddenly the cosy looking kitchen harbors the threat of the unknowable. Nothing is explained; non sequiturs and unanswered questions in the dialogue build up an atmosphere of confusion and dismay that turns threatening and then violent. Commonplace perceptions grow unstable; the everyday world metamorphoses into the site of nightmare. “Celebration” aims for quite an opposite atmosphere. It is a comic episode, a satirical skit, rather than a play with plot and consequence. Three working class couples celebrating a wedding anniversary at a trendy restaurant take turns at one-upping each other as well as toasting to each others’ success in business. They’ve come a long way economically and their next step, by implication, would involve a corresponding social mobility. They show no sign of being able to make the cut; rather it is clear they possess neither the requisite social nor linguistic skills to maneuver their way through the British class system. In any case, Pinter’s point about language as a dead give-away of background is probably clearer to British than to American audiences, who forgive deviations from a standard that is set after all by media. 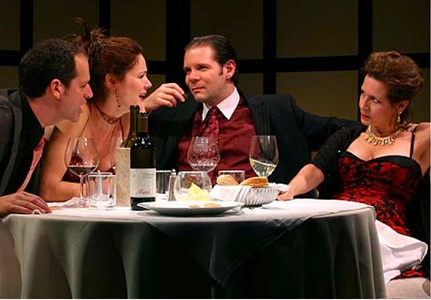 The couples’ waiter presents himself, intrusively, as a man of similar goals; visually as well as verbally hilarious, the waiter sidles and insinuates himself in his clients’ conversation. He affects a middle class background by citing his and “his grandfather’s” familiarity with great men of literature and culture. In fact, he need not bother with name dropping: these people recognize T.S. Eliot no better than he does or his grandfather either, the model he cites as a source of intellectual accomplishment. Pinter skewers them all with their deliciously vulgar style of dress and speech. These couples seem desperate to enjoy themselves, displaced as they are in a situation of their betters. Their pretense at comfort in the posh surrounding keeps them on edge and at each others mercy. It may come as a surprise that class, according to “Celebration,” remains as solid a social barrier in our time as it has been through English history. Film since the 1950’s has shown a slow but steady deterioration of class biases. Perhaps both positions are true; social change is a slow process. As for the actors, performances shine with an ease that comes of long professional experience and the sure hand of director Neil Pepe. Moreover, Mr. Pepe respects Pinter. Does that need to be said? Yes. Consciously or not, he knows he is serving Pinter rather than hauling in a work (of the right length, right language, etc) that will serve his theater. Let me digress to generalize here about the process of rating plays, good, bad, and indifferent, I suspect we want to be reassured that what we are hearing and seeing is symptomatic of a wider intelligence, that we are glimpsing the edge of perceptions richer and more varied than our own. Something like that probably accounts for the common impulse to seek out the writer’s biography, though it bears only tangential relation to the work. More likely, this has something to do with respect for that hint a work offers of bigger, richer, more. This sense of catching sight of a big thing–we always want that since we remain uncertain about the very existence of big things; perhaps we even are guilty of looking hard enough to see it when its not there. It’s difficult to get a clear definition of this commonplace desire without dipping into the mystical: that is, responding or wishing to respond to a non-existent wider intelligence may be plain lunatic. Call the implied action here, at least, a squint eyed glance at the usual to reveal the unusual. This has nothing to do with a secret wish to be baffled by a work, or to misperceive its complexity as its richness. Thus approaches a version of adolescent nightmare: it must be “good” since incomprehensible. Rather, most simply, another “take” on experience enriches our own. To reward any work of art for providing a mirror of life (pace WS) seems a tame idea unless the mirror slants at the hitherto unseen, yes through a glass darkly. Finally, to come to the point the other way round, where there is no mirror, tantamount to admitting there is nothing to be seen, the work is tedious indeed. The consensus says Harold Pinter’s work is important. He served up plenty of mirrors revealing working class England to London theatergoers. By mid career, his work was speaking to the country at large. By the end of his life, he was respected by the English speaking world. We count him now as one of the great contributors to 20th century life and letters.